deeply believes it is possible she will die during birth – to combat this fear she over researches and over plans every possible aspect that she can control. VERY regularly Arsenicum women will go into labour at 1:00 am after taking a dose of the remedy to induce labour. So if this is you, take a nap, this remedy has strong time modality. unable to let go of her fears long enough to go into labour, this remedy will ease the anxiety enough to allow things to progress. This is a remedy for second stage – Arsenicum women HATE pushing. They hate the intense sensation, the fear of having a bowel movement, the feeling of a freight train charging through their bodies! Occasionally they will say they have absolutely no urge to push but often they are stalled at this stage. A dose of Arsenicum will again alleviate the intense control so that they are able to move onward. Give two pellets of Arsenicum 200C and wait for the picture to unfold. 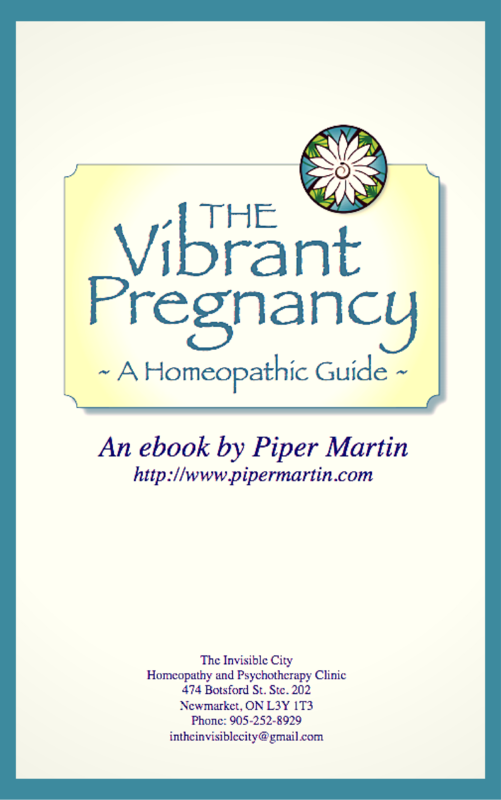 If you desire more information or guidance please visit my website – www.pipermartin.com. I have two e-books for self-reference and I provide homeopathic consults via email internationally. Homeopathic inductions are free and always will be.